National Hamburger Month Is Here! 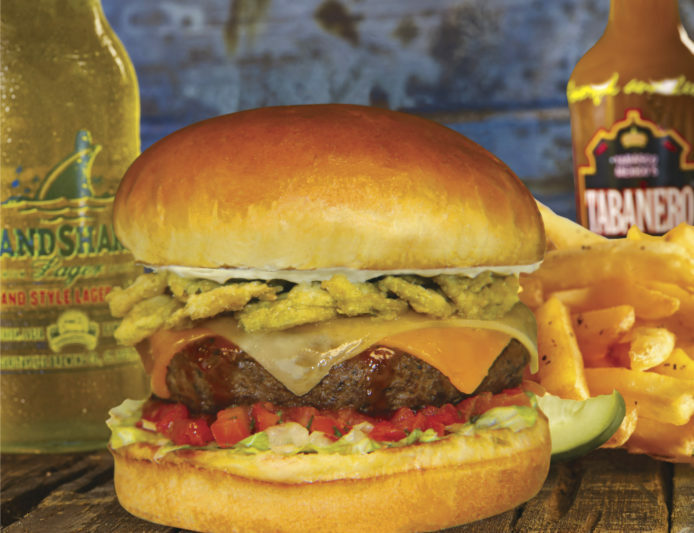 Try the Tabañero Taco Burger with a LandShark Lager* for just $15! This burger’s topped with Jack and cheddar cheese, Tabañero taco sauce, fried jalapeño chips and sour cream, resting on a bed of shredded lettuce and pico de gallo on a toasted bun. Served with french fries and your choice of a LandShark Lager bottle or 14 oz. draft beer. *Offer valid at Atlantic City, Chicago, Cincinnati, Destin, Las Vegas, Mohegan Sun, Myrtle Beach, Nashville, Panama City Beach, Pigeon Forge, and Syracuse. May is “Beach Burger in Paradise” Month and you can get yours with this tasty package! Book your May stay in Pensacola Beach and receive a Beach Burger in Paradise Appetizer for Two. These amazing burgers are only available with this exclusive package, so grab the deal before these burgers are gone! We’re also kicking off National Burger Month with a special culinary event, “Burger Battle By The Bay” on April 30th, followed by a new weekly burger each week at the hotel’s Frank and Lola’s Cafe. These creative, specialty eats happen just once a year, so get your tickets to Burger Battle by the Bay! Get your burger couture on for less and check out the great deals on burger print button down shirts, new graphic tees, and the famous cheeseburger apron & spatula. This delicious, sweet-and-spicy recipe from Margaritaville Foods calls for both the Original BBQ Sauce and Calypso Rub. Be sure to save $1.00 with our coupon and find a store near you! Take your backyard BBQ from tame to tropical with a surf-n-turf combo! Try our Grilled Hula Burger and Lime Shrimp-Stuffed Portabella or check out our recipes for more island-inspired inspiration! Get the recipe here and also save with $1.00 with our coupon!